The Roland SDX-330 is a high quality studio effects unit designed to provide exceptional digital effects such as Chorus, Flanging, Phasing and Delays along with a variety of pitch based effects. The effects produced by this unit can rival those of much costlier devices (often found in professional studios). This is because the Roland SDX-330 uses 16-bit, 44.1 kHz digital processing, and was designed as a result of painstaking efforts directed at redefining and redeveloping all the essential features that a professional-quality. The Roland SDX-330 provides newly developed algorithms which can deliver effects that are quite revolutionary-including a ‘three-dimensional’ effects which has its early reflections localized in a multiple number of positions in space. New effects such as th is are possible thanks to the technological expertise accumulated through Roland’s development of the RSS (Roland Sound Space) system. With every stereo algorithm, the internal processing of the left and right channels is done independently. This assures that every detail of spatial localization contained in the input signals is retained even after effects have been applied. The effects you obtain can easily and conveniently be altered while a performance takes place. Either pedals, or MIDI messages can be used to control specified parameters. 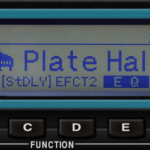 The 300 Program numbers of the Roland SDX-330 are divided into two areas; User Area and Preset Area. User Area (Program Numbers 1—200): The Program Numbers in the User Area can be used to store effects you create. The Roland SXD-330’s 100 factory programs are derived from 16 algorithms, with Parametric EQ and MIDI real-time control assignments common to all. STEREO CHORUS: a true stereo input and output chorus, with variable phase between left and right channels. STEREO 3D CHORUS: true stereo chorus, with 3D positioning added. 3D PANNER: Dynamic 3D panning effects, with control of speed, direction, and start point. SPACE CHORUS: a wide, spatial chorus, very accurately replicating Roland’s own SDD320 Dimension D unit. 2-BAND CHORUS: true stereo chorus with two-way band-splitting for separate chorusing of different frequency zones. Crossover point variable from 400Hz-4kHz. 3-BAND CHORUS: true stereo chorus, with three-way split. Crossover points, 100Hz-1kHz, 800Hz-8kHz. 4-BAND CHORUS: mono input, stereo output chorus, with four-way frequency division. Crossover points, 100Hz-1kHz, 400Hz-4kHz, 800Hz-8kHz. STEREO 8-PHASE CHORUS: a complex true stereo chorus, with independent parameters for each of the eight ‘voices’, including LFO phase and polarity. 16-PHASE CHORUS: a mono (in and out) chorus, with preset Modes, rather than independent voice parameter control. DETUNE CHORUS: a true stereo, non-cyclic chorus effect, with six high resolution pitch shifters in parallel. ENSEMBLE: stereo/mono chorus using LFOs of differing speeds. Uses Preset modes, rather than user-variable parameters. WAVE CHORUS: true stereo chorus, with choice of six LFO waveforms. VINTAGE CHORUS: Roland CE2-type analogue chorus simulation. STEREO FLANGER: true stereo flanger, with choice of LFO waveform. ROTARY: uncannily accurate simulation of rotary cabinet, complete with overdrive stage, and offset speed-up and slow-down rates for top and bottom rotors. Great! AMBIENCE CHORUS: chorus with simulated stereo ambience, adding greater spaciousness to the effect.